Amazon India is selling Oral-B Pro 600 Cross Action Electric Rechargeable Toothbrush (Multicolor) Rs. 1736 Apply both code one by one to get Rs. 1000 discount: ORALB600 & OBDEN600 only which is worth for Rs. 3800 at lowest and best price online.You can follow the below steps to buy this product at their deal price.Keep Visiting dealsheaven.in for more Best offers ,hot online deals, promo code, coupons and discount . 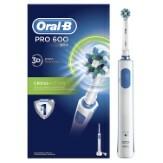 How to buy Oral-B Pro 600 Cross Action Electric Rechargeable Toothbrush (Multicolor)?